WASHINGTON - The Star-Spangled Banner will be one of 20 American flag designs honored by the U.S. Postal Service when it issues The Stars and Stripes postage stamps on June 14 in Baltimore. Twenty flags linked to the evolution of the Stars and Stripes since 1775 will be issued at a 7 p.m. ceremony in observance of Flag Day at Fort McHenry National Monument and Historic Shrine. The stamps will be sold at post offices nationwide the same day. "This should be a proud moment for all Americans," said Einar V. Dyhrkopp, presidentially appointed chairman of the Postal Service Board of Governors, who will dedicate the stamps. "Our flag is a revered and sacred symbol of all that we, as citizens of this great nation, hold dear to our heartsfreedom and democracy. Old Glory is known the world over as the symbol of one of the greatest nations on Earth. Today the Postal Service pays tribute to our cherished flag with the issuance of these beautiful Stars and Stripes commemorative stamps." The designs were chosen to provide a sampling of visually interesting and historically significant flags in U.S. history. Among the flags are the Continental Colors, and regional and military flags. The name of each flag either describes its design or places it in its historical context. Few of these flags have official names. The date on each stamp may reflect the most significant year in a flag's history, not necessarily the year the flag was created. The following selvage text was written by Dr. Whitney Smith, executive director of the Flag Research Center in Winchester, Mass. "One of the world's most powerful and widely recognized symbols, the United States flag has evolved over the past 200-plus years from a variety of local, regional, and national designs, including unofficial and semiofficial ones. "These 20 examples, which are based on the most recent research available, offer a visual sampling of variations on a theme. For artistic consistency, flag widths have been made uniform, and the same shades of red and blue have been used throughout." Verso text appearing on the back of the stamp pane provides a short explanation for each flag combining the most recent research available with historical anecdotes. 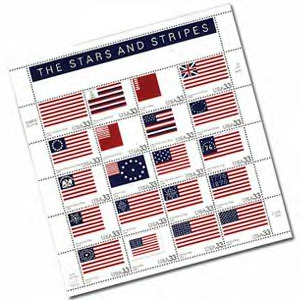 This stamp pane, composed of 20 different American flags, presents some of the historically significant developments in the flag from colonial times to the present day. These flags were selected for their historical significance as well as for their aesthetic value. The beauty of the stamp pane is based on the diversity of the designs and the theme of red, white, and blue. The Sons of Liberty, activists in defense of American rights, used this flag of 13 horizontal stripes to represent the unity of the Colonies. This flag probably inspired the stripes in Old Glory. Its red and white colors derived from the English flag. George Washington's military secretary, Col. Joseph Reed, proposed that all American ships fly the Massachusetts Navy flag. This "Americanized" version of the flag links a regional symbol, a New England pine, with the now familiar national colors. According to Forster family tradition, this flag was captured from the British by Minutemen on April 19, 1775, the first day of the Revolution. White stripes then replaced its original canton; with the red background, they represented the 13 Colonies. The British Union Jack on our first national flag, in use during the early years of the Revolution, sent a clear message. Until the colonists proclaimed independence in July 1776, they were fighting for their rights as subjects of the King. Continental Congress member Francis Hopkinson designed the first Stars and Stripes. His stars may have formed rows or a ring; the exact design is not known. In a resolution of June 14, 1777, they were said to represent "a new constellation." In the Revolution, military units often had different flags (or no flags). Reputedly carried at the Battle of Brandywine on September 11, 1777, this flag was one of the first with stars and stripes. New research indicates it may have been a militia color. After John Paul Jones and the crew of "Bonhomme Richard" captured HMS "Serapis" on September 23, 1779, a Dutch artist painted a watercolor of this flag, which Jones had hoisted in victory. Blue was considered America's prime national color. Pierre L'Enfantthe architect who would create the original plans for the nation's capitalsketched this flag on a proposed membership diploma for the Society of the Cincinnati, a veterans' organization for officers of the Revolutionary War. The American government often presented the Stars and Stripes to friendly Indian nations. These "Indian Peace Flags" displayed the U.S. coat of arms and usually accompanied other gifts, including medals with the words "peace and friendship." During the War of 1812, patriotic citizens of Easton, Pennsylvania, presented this flag to their First Company, First Regiment of Volunteers. The striped canton and starry field of this design reversed the official placement of the stars and stripes. At Baltimore's Fort McHenry in 1814, the Star-Spangled Banner came under British fire in the War of 1812. Its "broad stripes and bright stars" inspired Francis Scott Key to write words that, set to music, later became our national anthem. Long believed to date from the Revolution, the Bennington Flag was possibly made between 1810 and 1830. It could have been created during the War of 1812, or in 1826 to celebrate the 50th anniversary of the Declaration of Independence. An 1818 act established that the flag include a star for each state and 13 stripes. Capt. Samuel C. Reid, a naval hero of the War of 1812, recommended arranging the stars into one large star pattern, a common design in the 19th century. In 1845, the diamond pattern became standard on garrison flags, enormous versions of the Stars and Stripes flown at large Army posts. Such flags could be easily updated after new states were admitted; in 1847, the 29th star (for Iowa) was added. This flag was flying over Charleston's Fort Sumter on April 12, 1861, when the Civil War began. More than half a million brave men from North and South died before the very same flag was hoisted there again in 1865. The unusual pattern of this 1877 design includes a star for Colorado, admitted as the 38th state on August 1, 1876. Until 1912, when rows of stars became standard, flagmakers could use imaginative designs to accommodate new stars. This version of Old Glory was official from 1912 to 1959the longest period any fixed star pattern has been used. Americans saluted this flag during two World Wars, the growth decades of the 1920s and 1950s, and the Great Depression. When the 50th star (for Hawaii) was added on July 4, 1960, our current Stars and Stripes was born. The U.S. flag stands for our Constitution and the American way of life, as well as our past achievements and dreams for the future. Other stamps in the Classic Collection, which began in 1994, include: Legends of the West (1994), Comic Strip Classics (1995), Civil War (1995), (1996) Centennial Olympic Games, Classic American Aircraft (1997), Four Centuries of American Art (1998), Insects and Spiders (1999), and Legends of Baseball (2000).